Okay, I must admit that there have been some indiscretions lately... No no, not like Tiger Woods. ABC, Sui Sha Ya, Knight & Day and now Denny's. Those would be considered indiscretions by most food-loving people. However, there are 2 good reasons I am at Denny's today. First, for research and blog purposes. Second, being that it was my birthday, I decided to heck with it, I'm getting myself a free meal! With my picture ID in my pocket and a nervous stomach feeling queasy already, we made our way out to Denny's for breakfast. 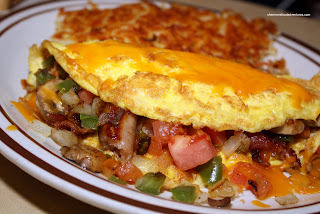 I have to admit one thing, I used to enjoy visiting Denny's at one point in my life - when I was too drunk to realize it... Now, it's only reserved for breakfast if anything else. Face it, everything on the menu at Denny's is a shade of brown. If it ain't deep-fried or pan-fried, it doesn't make the menu. Rather than eating a breakfast, I decided on the Double Cheeseburger. Man, I didn't expect the burger to be that big. It was so tall that I had to remove one patty just to eat it. And you know what? It really wasn't too bad. It turns out that Denny's has recently changed how they make their burgers. Going from the frozen pre-made patties to a hand-made fresh patty, it has made a world of difference. It was thick and greasy. Yes, I would've used the word "juicy"; but it really wasn't. Each time I pressed down on the patty, the only thing that squeezed out was fat. Not the most appealing sight; yet it was moist and quite meaty tasting. The addition of real cheddar added to the greasy experience. 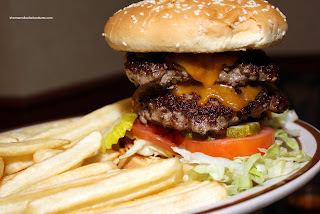 However, this burger will shorten your lifespan. Although, I really didn't like the fries. Paler than Nicole Kidman, they were a bit undercooked and not crispy at all. 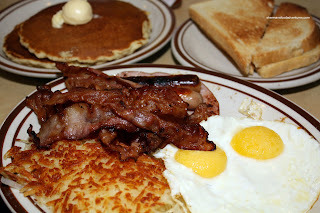 Ma had the Lumberjack Slam which included an obsce ne amount of food: 2 eggs, 2 sausages, 2 bacon strips, ham, toast, hash browns and pancakes. The appearance of more bacon on her plate of food was a result of somebody else not wanting theirs. Well, there is not much to complain about in terms of quantity of food and honestly it is fine - if you want the cholesterol for the week in one plate that is. And this brings up the main point of Denny's. It is definitely not a place you expect great food. In fact, some might argue it's the antithesis of good food. However, the prices (at least for breakfast) are reasonable for the amount of food you do get. Now after my free meal (well, if someone else eats too and you gotta order 2 drinks), you'd think I had satisfied my Denny's quota for the year. Wrong! My birthday only comes once a year and I ain't gonna waste it! So after waiting for Viv to get home from work, I had already planned my second visit to a different location. That's right folks. 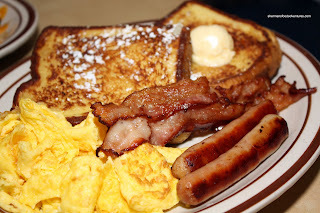 I went to Denny's again, for dinner! I told you I had a few indiscretions. It's like Tiger visiting one of his mistresses more than once in a day. For my second free meal, I decided to start with a Half-Sampler Platter which features all of their fried starters. 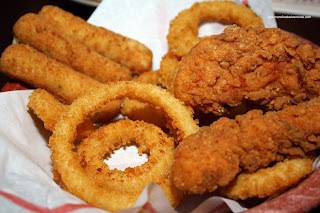 How about some fried cheese sticks, onion rings and chicken strips? All representing a different shade of brown, these cholesterol morsels weren't half bad. Well, the cheese sticks were gross once they cooled down. I just ate the cheese in the middle. Feeling a bit guilty from eating Denny's food all day, I went for one of the few healthier items on their menu. 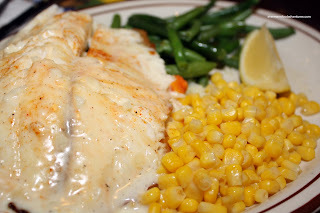 It wasn't hard spotting it since it was in a different shade - the Lemon Pepper Tilapia. Surprisingly, the fish was cooked perfectly being soft and flaky. There was good lemon zing and the side of string beans and corn were not overcooked. Not gourmet eats by any stretch of the imagination; yet this dish cost $13.99! For that price, I'd eat somewhere else. 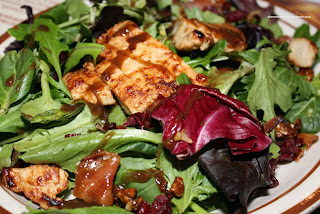 Viv also had a dish that can be considered "healthy" in the Cranberry Pecan Salad. Her initial response to the dish was "WTH is this?" Yah, it looked like a pile of spring mix with stuff thrown on top. Yes, there was chicken, but little in the way of cranberries or pecans. Furthermore the "balsamic" dressing was more like a sweet slurry. I know, I know, we shouldn't come to expect much out of Denny's. Another reason I visited Denny's twice in one day was merely born out of mischievousness. I thought it would be a funny post if I did. Well, I'm not sure if it was all that funny. Maybe my stomach might consider it a cruel practical joke. Definitely unhealthy. Funny? That's up to you. Moons over my hammie with a strawberry shake please :) extra hashbrowns with beaucoup de ketchup aussi! Yes I admit it Mel, I've had the occasional craving for Denny's... Just not that often! Yes Trisha, I do secretly like Denny's breakfasts. Not sure about the blob of butter though!